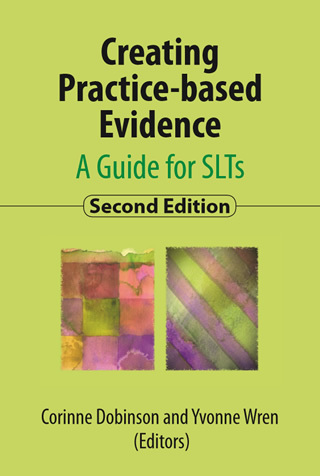 Speech and language therapists working in clinical situations are in a unique position to contribute to the evidence base. Clinical queries generated from everyday practice can develop into viable research questions which directly relate to SLT services and service users. Corinne Dobinson is a Highly Specialist Speech and Language Therapist whose specialist role includes supporting SLTs in matters of research. She has taught as a visiting lecturer on undergraduate and postgraduate courses at College of St Mark and St John, Plymouth with respect to motor speech disorders and the use of technology in speech and language therapy. She has presented at national and international conferences on personal research, and has written and co-authored peer-reviewed publications. Yvonne Wren is Director of Bristol Speech and Language Therapy Research Unit, part of North Bristol NHS Trust. She is also a Senior Research Fellow at the University of Bristol and Chief Investigator of the Cleft Collective Speech and Language Study. She has over 20 years' experience of carrying out applied research in the field of speech and language therapy, with a special interest in speech sound disorders in children. She is Chair of the Child Speech Committee of the International Association of Logopedics and Phoniatrics and was founder and chair until 2018 of the UK and Ireland Child Speech Disorder Research Network.